This time of year in Newfoundland usually requires a lot of snow clearing. We shovel our driveway rather than using a snowblower and the sides of the driveway can really pile up high if we get a lot of snow. Years ago, Paul taught me that it's important to throw the snow as far as you can at the start of the winter, rather than just dumping it at the side of the driveway, because if you throw it then the pile starts farther back, giving you more room for the snow that will come later in the year. Even with that, though, there are years when by spring everyone is saying "there's nowhere to put more snow!" Sometimes we've been blessed by a snowplow driver who would take the snow at one side of our driveway and push it farther into our yard, giving us more room. What a huge difference that makes! I remember being out one day, though, when a plow drove by as I was shoveling. The driver stopped and said he would help, but there was no where even for him to put the snow. The pile was already so big, and had been pushed back so many times, the plow just wouldn't be able to push it back any farther. Now that's a lot of snow! We were out shoveling a few days ago and Zach was just dumping the snow by the side of the driveway, so I told him to throw it back and explained why. After, I kept thinking about the pile of snow and how it's harder to deal with as it gets bigger. It made me think of people who think their pile of sin is too big for God to deal with. Thankfully, God is more powerful than I am, and even more powerful than a snowplow. There is no pile of sin so big He can't remove it. Paul wrote, "But where sin increased, grace increased all the more, so that, just as sin reigned in death, so also grace might reign through righteousness to bring eternal life through Jesus Christ our Lord" (Romans 5:20,21). 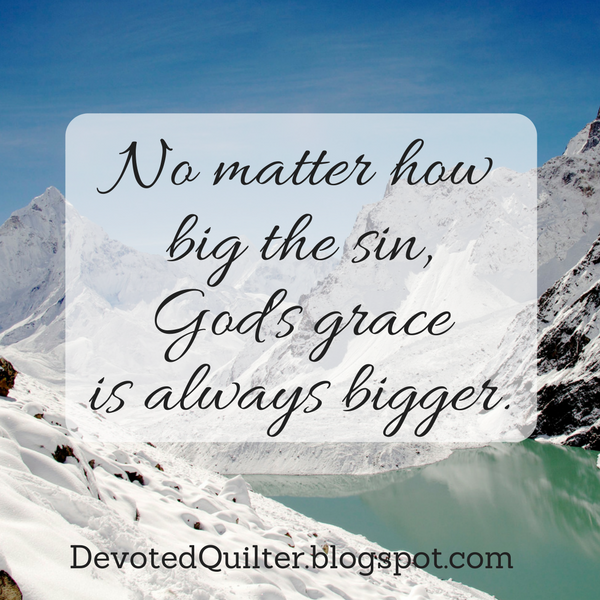 No matter how big the pile of sin in a person's life, the power of God's grace will always be enough to remove it! But it's not only those who aren't believers who think their sin is too big for God. Sometimes believers do something that is so wrong they feel like they can't ever be forgiven for it. Thankfully, that isn't true. No matter what we do, God is always willing to forgive us when we ask Him to. 1 John 1:9 says, "If we confess our sins, he is faithful and just and will forgive us our sins and purify us from all unrighteousness." He will purify us from all unrighteousness. No matter what the sin is, or how much the sin has piled up, He will forgive us and purify us. Isn't that a wonderful thought? Thank you for sharing. Even as a Christian, sometimes one's sin can seem so overwhelming lest we forget that God is in charge and forgiving.